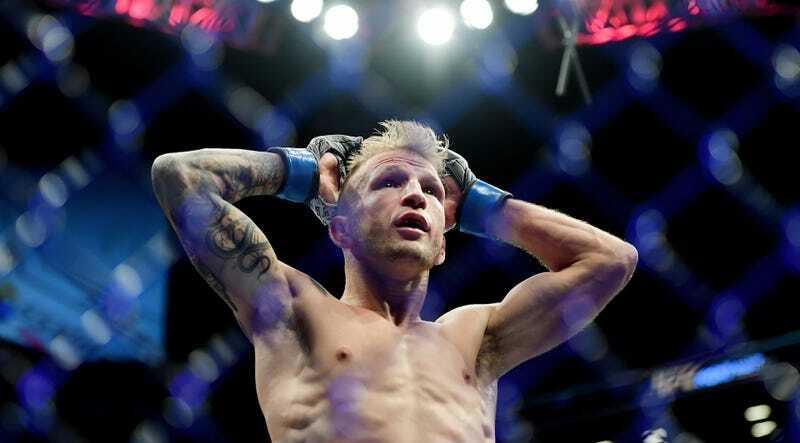 After defending his UFC bantamweight championship against Cody Garbrandt last year, T.J. Dillashaw sought to shut down the flyweight division by whooping on Henry Cejudo then possibly move up to 145 pounds and fight Max Holloway. But now, instead of having three title belts, he has zero. Dillashaw, who was quickly rocked by Cejudo in January, announced today that he’d relinquish his 135-pound title after something came up in his drug test taken for that match. He’ll also be suspended until January 2020. Dillashaw didn’t specify what the problem was, and the NYSAC only confirmed that his suspension stemmed from “violations relating to use of a prohibited substance.” His suspension was issued by the NYSAC, not USADA, and the USADA wouldn’t confirm whether they would suspend Dillashaw as well. After lasting only 32 seconds against Cejudo in January, Dillashaw had planned to defend his bantamweight title against the same fighter at some point this year. Cejudo’s head coach admitted to ESPN that the suspension “throws a wrench in our plans,” which is great because a rematch would most likely have sucked. The UFC has booked three trans-division championship bouts over the past year, and all of them have ended quickly and violently, with the smaller fighter knocking out the larger fighter in the first round. With a lucrative fight against Dillashaw now off the table, Cejudo can now defend his belt against Joseph Benavidez and keep the flyweight division moving. Meanwhile, Dillashaw’s abdication probably opens the way for Marlon Moraes to finally fight for the bantamweight title, which hopefully will mean more interesting fights in the UFC’s deepest division.